The perfect magazine for all puzzlers! With a great mix of over 170 small and large puzzles over 128 pages, there's something for both those of you who have five minutes to spare and those who are fixing a cuppa for a nice relax with a pencil and a puzzle. Puzzle Mix is also a great introduction to many of our other Puzzler titles as you may come across something you haven't done before and just fall in love! Then you'll be able to find a dedicated Puzzler title for that puzzle: whether it be a logic problem, arroword or codeword, we've got you covered! There's also a wonderful big-prize competition that appears in every issue. 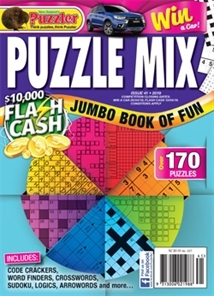 We've had cars, holidays and cash giveaways – just buy your issue of Puzzle Mix, follow the instructions on the coupon and send it in to enter. As they always say, you've got to be in it to win it! Puzzles included: Add-A-Letter, Alphabetical Jigsaw, Anagram Crossword, arroword, Backwards, Battleships, Blockbuster, codeword, Continuity, crossword, Digit All, Dilemma, Double Kross, Dropout, Honeycomb, kriss kross, Linkword, Logic Problem, Missing Links, Pathfinder, Pieceword, quick crossword, Quiz Cross, Shortcode, Skeleton Codeword, Skeleton Crossword, So Complete!, Spiral, Step Ladder, Sudoku, Take Five, Thrice As Nice, Tinker, Tailor…, Two-By-Two, Two-Timer, Ultra Quick Crossword, wordsearch, Who Said That?